Fish oil is perhaps the single most effective nutrient for both wellness and antiaging purposes. No less an authority on nutrition and fats, Dr. Mauro DiPasquale is said to have challenged top strength and conditioning expert Charles Poliquin to find a disease or health condition for which fish oils were NOT beneficial. After approximately 80 searches, Charles could not find a single health condition that did not benefit from the proper use of this amazing nutritional supplement. Omega 3 oil is extracted from the bodies of cold-water fish like mackerel, salmon, and cod. They are then purified to pharmaceutical grade standards (in the top quality products like Nordic Naturals) and sold as either gel capsules or liquid. Below is a short list of omega 3 oil health benefits. Pharmaceutical grade omega 3 oil is a product that has been extracted and purified to a standard required for pharmaceutical products. It is the purest form you can buy and is free from mercury and other toxins that a lesser quality oil might contain. This is why you must choose carefully when buying this product, and know which sources offer this highest grade of purity such as Nordic Naturals. Mercury contamination is a problem with fish and fish products and should be avoided if at all possible. The best quality oils will be refrigerated or at least stored in a cool environment. There are a number of reputable brands, such as Life Extension, or Nordic Naturals, which are two of my favorites. I have used the Life Extension brand for my father who is 86, so I trust their quality. They will have the complete distribution of of all eight omega 3 fatty acids, and be cold pressed from healthy fish, with no other added oils. You should also be able to see the species of fish from which the oil was extracted on the product label. Data has shown that omega 3 oil supplementation increases lean body mass when there are sufficient calories in the diet. It also boosts your basal metabolic rate and increases the burning of fat vs carbohydrates. This is important because it means the body will use stored fat for energy rather than carbohydrates, allowing you to burn up your stored bodyfat! Exactly why omega 3 oil is so beneficial has not been precisely determined. Fatty acid metabolism is at the heart of many of the body’s vital functions and since the fatty acid balance of our modern diet is deficient in the omega three fatty acids, supplementation can only be beneficial. Omega 3 oils reduce something called blood platelet aggregation. This means that it inhibits the clotting ability of the blood. This is generally beneficial, however if a person is on anti-coagulant medications (commonly called blood thinners)the anti-coagulant effect can be increased too much leading to internal bleeding. This compounding effect is not a problem for normal healthy individuals, however those individuals on medications to thin the blood, should get their doctor’s ok before using any supplement that can decrease the blood’s clotting ability. 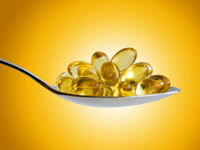 Fish oils health benefits are so many, that it comes closest to being the perfect supplement. Because of the mounting evidence for it many health-enhancing qualities; there are more and more reasons to include it in your antiaging program.